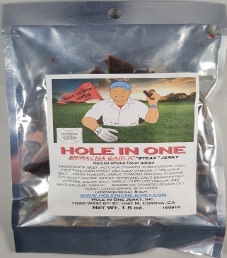 The next review for Hole In One Jerky will focus on a 1.5 ounce/42 gram bag of their Sriracha Garlic flavored steak jerky. 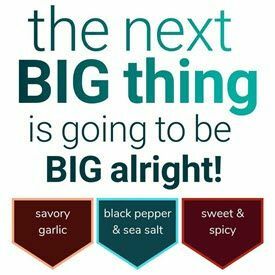 This flavor is described as giving a little kick of spice, and a great finish of garlic. 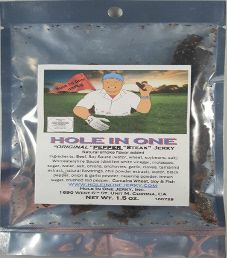 The bag was kindly submitted for review by the owners, Bud & Crystal Ott. 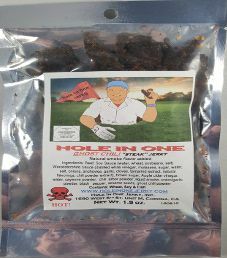 The first review for Hole In One Jerky will be on a 1.5 ounce/42 gram bag of their original pepper flavored steak jerky. 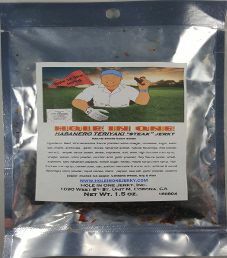 This flavor is described as pepper steak hot off the BBQ, with no knife or fork required. The bag was kindly submitted for review by the owners, Bud & Crystal Ott.